Thank you for taking the time to talk with me today. I was really excited that it has almost reached my 2 year mark from my surgery date. Like I told you earlier, I have lost a combined total of 220 lbs*. My experience with BeLiteWeight as well as Dr. Jose Rodriguez, Dr. Elmo Aramburo and Star Medica hospital was second to none. It was a great experience. I was treated excellent at an top notch facility in Juarez, Mexico. I was, as you can imagine, a bit nervous about going to Mexico for my procedure (Gastric Sleeve) but was in fact treated better there than I was when I had back surgery here in Houston, Texas the previous year. The facility was clean, very modern and well taken care of. The staff from housekeeping to the surgical team all treated me as though they were treating a family member. I was thoroughly impressed and recommend it to everyone that asks. 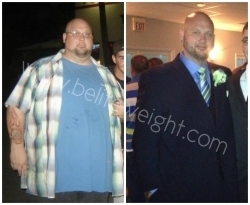 I am enclosing a few before and after pictures. I want to thank everyone from your staff for making this possible and a very pleasant experience.